The picture at right shows the filter in “service” position. This is how it works when it is doing the job it is designed to do. The unfiltered water enters from the left and is routed by the control valve into the filter tank. The water then filters slowly through the medium until it reaches the bottom of the tank where it is collected through a specially-designed sieved “basket” at the bottom of the center tube seen in the picture. The filtered water then passes up through the center tube, called a “riser” or a “dip tube,” passes through the control valve, and exits the right side of the filter. Note that there's a drain line in the picture, but no water goes through it during the filter's “service” function. As the filter operates in the service mode, it traps and holds particles in the filter bed. Also, since water's nature is to follow the path of least resistance, after a time it begins to cut channels through the medium. As channels or holes in the media bed form, water begins to flow around rather than through the medium. This process is called “channeling,” and it can reduce the effectiveness of the filter considerably. At a preset time, the control valve initiates a “backwash” to clean the medium of collected particles and to resettle the bed and eliminate channels that have formed. The backwash is accomplished by sending water down the riser tube from which it enters the filter tank at the bottom. The force of the water is such that it actually lifts the media bed, swirling and tossing the granular medium. The water leaves the filter tank through the control valve, which routes it through the filter's drain line. Particles that were being held in the bed are washed to drain. After the backwash, the control valve initiates a “rinse” of the bed during which water flows downward through the medium, up through the riser tube, and out the drain. The purpose of this rinse is to rinse and settle the bed and prepare it for return to service flow. Tanks. Called “mineral tanks,” most are made of polypropylene and/or polyethylene with fiberglass reinforcement. Mineral tanks are very strong and usually guaranteed for up to ten years by the manufacturer. Control Valves. Most modern filters use timer-style controls in which an electric timer initiates and controls the backwash of the filter at a pre selected time. Meters, which backwash the media when a certain number of gallons have been treated, are used widely on water softeners but much less frequently on filters. Some very sophisticated setups can initiate backwash in response to a pressure differential between the incoming and outgoing water, but for most situations, the standard, reliable timer control is preferred on backwashing filters. Granular Activated Carbon. For chlorine and chloramine reduction, taste/odor improvement, general chemical reduction. Carbon can also remove sediment and even iron if the iron is pretreated properly. It is the most commonly used medium for hydrogen sulfide reduction. Granular carbon is the preferred treatment for many chemical contaminants. It is perhaps the most versatile and universal of filter media. Birm. For reduction of iron and manganese, under the right conditions. As iron media go, Birm is relatively light in weight and hence easy to backwash. It is also low in cost, so it's a popular iron medium although it has some drawbacks. A pH of at least 6.8 is normally required for Birm to remove iron. Calcite. To increase the pH of acidic water. Calcite is a sacrificial medium that dissolves as it works and has to be replaced. Centaur Catalytic Carbon. Reduction of chlorine, chloramine, hydrogen sulfide, and iron. A relatively expensive grade of specially prepared carbon, Centaur is a favorite for chloramine removal on city water systems. Multi-Media, consisting of layers of such natural elements as garnet, sand, and anthracite: Used for the reduction of sediment and oxidized iron, multi-media filters are slowly being replaced by newer granular zeolite media. Filter Ag, Zeolite, Micro Z. These are all common “sediment” media. They reduce particles in water down to 20 to 5 microns. These are usually natural zeolite products. Greensand. Reduction of iron and hydrogen sulfide. Greensand is usually used with a potassium permanganate feeder. Filox. A natural mined mineral, Filox is known for high level iron removal and reduction of hydrogen sulfide odors. It is very dense and requires frequent and intense backwashing. Backwash Rate. 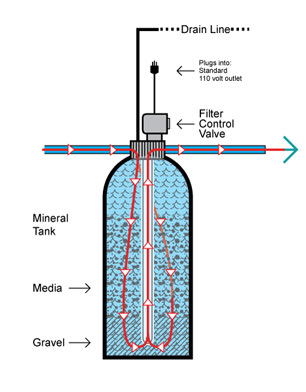 Backwash flow rates differ significantly from filter to filter.The correct backflow rate is essential to proper operation of a backwashing filter.The correct backwash flow rate is determined by considering the square footage of the surface of the media bed and the density of the media. The filter must have a flow control installed in the drain line to allow a backwash flow rate sufficient to raise and cleanse the media bed but restrictive enough to prevent media from being washed out the drain line. For example, a carbon bed in a 10" X 54" filter tank is usually installed with a five gallon-per-minute flow restrictor. Five GPM is sufficient to lift and clean the bed, but carbon is dense enough that it will not be washed out of the drain line during backwash. By contrast, KDF, a very dense medium, requires a backwash of more than 15 GPM in the same filter. Service Flow. 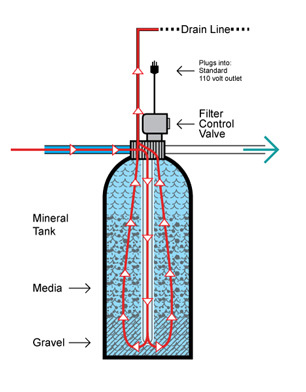 Service flow of the filter is limited by the size of the tank and the nature of the medium. Some media require longer to work than others. Media are rated according to the service flow they can support by a measurement called “empty bed contact time” in filter-maker jargon. When the recommended contact time for the medium is violated by excess service flow, the filter is less effective and the life of the medium is usually shortened. It should be noted that empty bed contact time requirements are frequently violated in residential filters. For example, filter carbon in a 10" X 54" filter has a performance limit of about 3 gallons per minute, but such filters are frequently used in residential applications with much higher flow rates. There is no great harm in this since the undersized filter removes most of the chlorine most of the time. However, if the same filter is used to reduce dangerous organic chemicals from well water, its upper service flow rate should be limited to perhaps one GPM, and exceeding this limit could have serious consequences.